Dry Fork Station, July 2009. As we get ready to celebrate our nation’s Independence Day, the stars and stripes are even more prominent than ever. 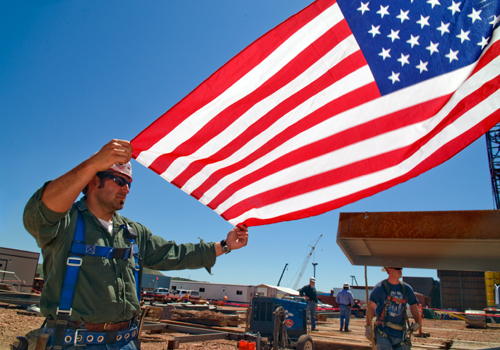 Did you know the U.S. flag plays a special role in many power plant construction projects? The flag is used during topping out ceremonies at power plants. When the final beam of steel is ready to be lifted into place, workers place a U.S. flag and evergreen tree on it for good luck. Watch the video from Dry Fork Station’s topping out ceremony. We thought you’d have fun seeing the photos and video we’ve captured of these ceremonies, both at Dry Fork Station, and a special topping out at Leland Olds Station.